My husband’s favorite ice cream is strawberry. In fact, it can be a point of frustration between us when we go to Convention Grill for dinner. We always split a malt, and it always has to be strawberry. Their malts, even a 1/2 order are fit for a family of 4, so I can never finish one on my own and prefer to share, but does it ALWAYS have to be strawberry? Yep, married for 20 years in August and that is what the man likes, so be it. 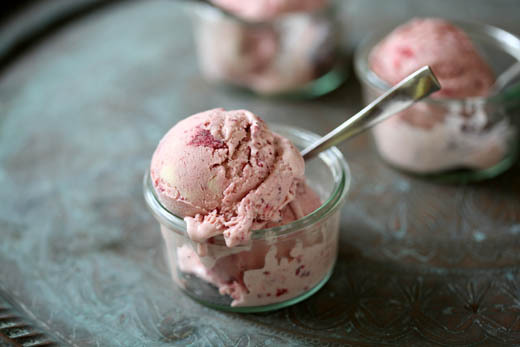 When I saw the container of strawberries from the farmer’s market I knew instantly that I would use them in ice cream. The color was outrageous and they just begged to be dipped in cream, but not until I roasted them in a touch of balsamic to add even more character. I roasted them to concentrate the sugars and to get rid of the excess water content before mixing them in the vanilla custard ice cream base. This produced a more intense strawberry flavor and a much smoother, less icy consistency. I like to leave some chunks in my fruit ice cream to add texture and drive the favor home, but not if those chunks are hard as a rock. Roasting the fruit first created the perfect flavor and texture. I even made a malted milk shake for my husband with it, which was CRAZY good! 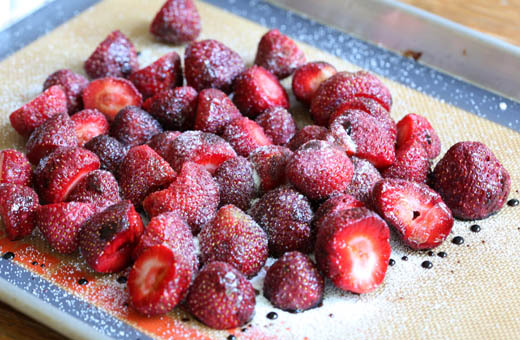 Toss the berries with the balsamic and sugar, lay them out on a Nonstick Silicone Mat covered baking sheet. Make sure you use one with sides, because the juices will over run the pan. Place the pan in the oven and turn it on to 300°F and slowly roast them until they have given up their juices and are kind of mushy looking. Their color will also be darker. This will take about 30 to 45 minutes depending on the size of the fruit. Scoop the fruit and all of its sugars into a bowl. Add the cornsyrup to the fruit, it will add sweetness, but will keep the ice cream a silky smooth texture. I like to use a potato masher to crush the berries, which leaves small chunks of fruit. 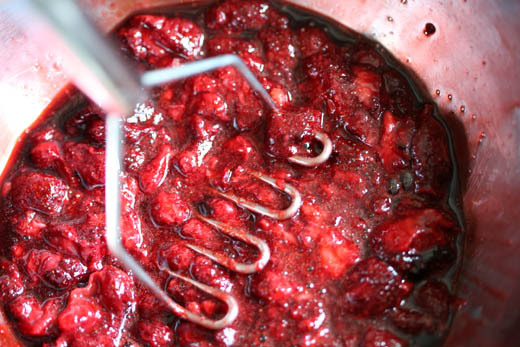 If you prefer a smooth ice cream you can puree the berries with an immersion blender. Chill the berries until they are very cold. Add the berries to the vanilla ice cream base and freeze according to your Ice Cream Maker ‘s instructions. While it is in the machine, place a bowl in the freezer to have ready to scoop the ice cream into. Once the ice cream is frozen to a soft-serve consistency, scoop it into the frozen bowl and place it in the freezer for a couple of hours to firm up. Scoop and eat it as it is or make it into a malted milk shake. Coffee Ice Cream – you will get addicted to this! so INTERESTING! I would never have thought of roasting strawberries. sounds amazing…and the ice cream is beautiful! I was literally JUST reading about roasted strawberries in chicago’s Edible e-zine (which I’m probably the very last person ever to discover). This sounds like an amazing way to use them up and I just got a bunch of beautiful strawberries this past weekend. Thank you for sharing! Oh yummy! Must try this. Thank you for sharing! Even when having strawberries normally, I always add a little balsamic vinegar and sugar or Splenda. It makes them so much more flavourful. Is there a substitution for the balsamic vinegar? You can leave the balsamic out of the recipe, but it really doesn’t taste at all vinegary. It is like adding just the right amount of salt to a recipe, it enhances it, without really knowing why it tastes better. I made a roasted strawberry ice cream fro Canada Day with a Chocolate Balsamic sauce. Just so good!!!!! Love it! I’ve always believed that almost any vegetable is better roasted, but it never occurred to me to roast strawberries. Must try soonest! Ohhh I’m thinking roasted mango ice cream!!!!!!! Your ice cream is so very, very pretty. 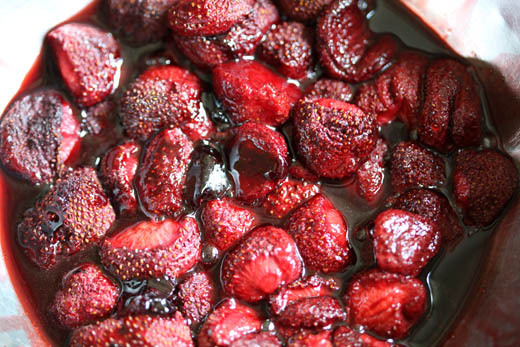 I love strawberries with balsamic and can only imagine the depth of flavor – I would love just one scoop. for those of us without an ice cream maker, could we stir these into pre-made vanilla and refreeze or spoon over it? This is a WOW. Gorgeous! Pure delicious gorgeous genius! Can’t wait to try. YUM! Cannot wait to try this soon. Our strawberries here in CA aren’t very sweet yet so I’m sure the combination of balsamic, sugar and roasting will make them taste amazing! Love your blog! Oh..I love this roasty toasty ice cream! Must have tasted delightful. Would like to do the same with my mango ice cream also. strawberry is my husband’s favorite flavor also. must make this for him! that scoop is perfection. thank u! What a beautiful recipe, Zoë. I will definitely try roasting my strawberries before putting them in my ice cream. Thanks! What other fruits would you roast before making them into ice cream? Peaches and apricots? I think this process will help concentrate the sugars and rid the excess water content of most all fruits! Both Peaches and apricots will be wonderful, but will take longer to roast. Fresh picked strawberries are unreal delicious! Love the idea of roasting them AND of adding balsamic. Such a wonderful idea! It makes complete sense. Now if only a bowl would suddenly appear right now. How did I miss this?? Roasting the strawb first? What a great idea! You genius! This looks just lovely. We used to always tease my dad for choosing strawberry ice cream while we dipped into more exotic flavors, but now looking at your pictures, I think he might have been onto something. Strawberries are my favorite fruit. I never thought of roasting them so I will have to give it a try. Searching for a strawberry ice cream recipe and was so excited to see you mention the Convention Grill!!! That was where my dad used to take me on father daughter lunch dates! You are right- one malt is plenty for two people. Luckily his favorite flavor was mine too- chocolate banana. We always ate the malt as an appetizer before the burgers. I am glad I stumbled upon your website- it looks like there are some great recipes to try out! Hi, Zoe! I don’t see your email address to contact you, but I wanted to give you a heads-up that your link to sweet corn ice cream at the bottom of the post actually redirects to the white peach ice cream. Thanks for these recipes! 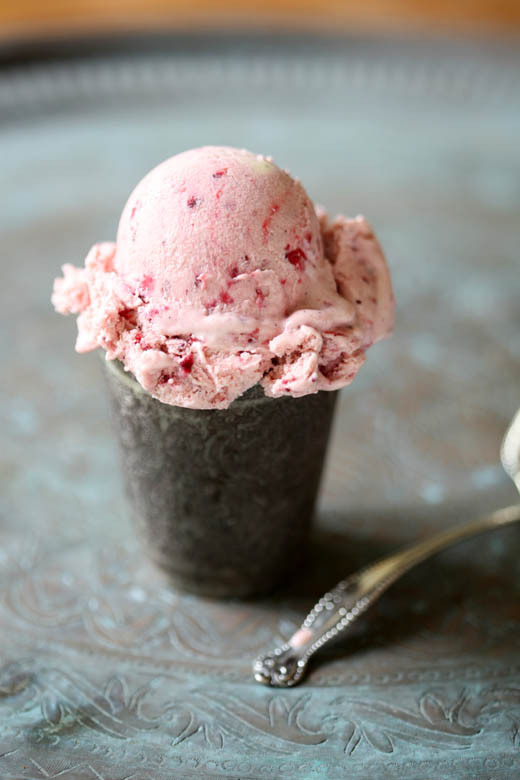 I made this ice cream and it is truly the best strawberry ice cream ever!! And really my least favorite ice cream “used-to-be” strawberry. I made your roasted banana ice-cream it was fantastic. Now i would like to try your roasted strawberry ice-cream. Could you please tell me is there a substitute for corn syrup. You can use Lyle’s golden syrup, honey or agave. You can substitute equal amounts of the sugar for this recipe. You want to add the sugar and balsamic before you roast so that the sugar melts and the vinegar reduces into a syrup. Wonderful idea, I should try roasting strawberries, I have to find out what they would taste like. How much ice cream does a batch make? I’m excited to try it out!! This batch almost filled my 2 quart ice cream maker. Is that 3/4 of a pound of strawberries in the picture? Like 12 oz? It looks like a lot more. I’m getting ready to make this and don’t want to use the wrong amount, but my berry pile looks a lot smaller! I have made this ice cream 2x now and mine never seems to come out how I anticipate it to come out. My color is noway never the color of yours. My 2x making it I used a pound of strawberries and it turned out to have a hint of strawberry flavor. Lastly, my berries in the made ice cream were icy…what am I doing incorrectly? I really want to try this ice cream by the look of it it looks and sounds amazing. Are the strawberries you are using fresh or frozen? If they are fresh do they have a lot of flavor and color? Sometimes they are bright red on the outside, but when you cut them open they are white. They can also have a higher water content and lower sugar content, which effects the flavor and iciness of the ice cream. If you are using fresh berries that are not very flavorful you may want to try this recipe again with frozen fruit. The companies tend to use riper fruit when freezing, so they have a lot of flavor. That is a perfect scoop of ice cream. Beautiful! Since your husband loves strawberry ice cream, I came across a website that says using sour cream will make the best strawberry ice cream hands down. Here is the link if you are interested to read about it and the comments were very positive too. This sounds absolutely delicious! Can’t wait until strawberry season! This will be a hit in the house. Thanks. This is so brilliant. Love!! Just seeing this – 2 years late! – on Pinterest and just wanted to say that this a fabulous idea. I’m just thinking roasted rhubarb AND strawberries would be exquisite. Thanks for this. Gorgeous site. Would this roasting strawberries. work for strawberry jam with instant fruit pectin? new at all this. thx. Would In still use the balsamic vinegar, or just sugar and pectin as that package calls for? What a brilliant recipe! I’m a few years late to the party, but hoping you can still give some advice! I roasted up 3/4 lb strawberries last night (weighed before I cut the tops off) w/ a Tbs balsamic and I didn’t get nearly as much juice as it looks like you got in that picture of the roasted strawberries. Also, the juices all hardened and stuck to the mat so I had to rub the strawberries around on the blackened juices to loosen it from the mat. What I ended up with is very dark and pretty darn balsamicy. Any idea what I may have done wrong? Should I have weighed after I cut the tops off? Any other tips about avoiding hardened juices? Thanks so much! Your strawberries may not have been as big and watery (the little ones tend to be more flavorful and concentrated with sugar) as the ones I used. If you try it again, you can reduce the baking time. If the juices do concentrate and caramelize a bit, just add a touch of water to the pan and they will losen up. when you add in the extra strawberry does it not water down the custard meaning it makes the custard more runny? Would it effect the freezing? Roasting the fruit evaporates some of the water in the berries, so they don’t freeze as hard in the ice cream and don’t make the base too runny. Wow, Zoë! 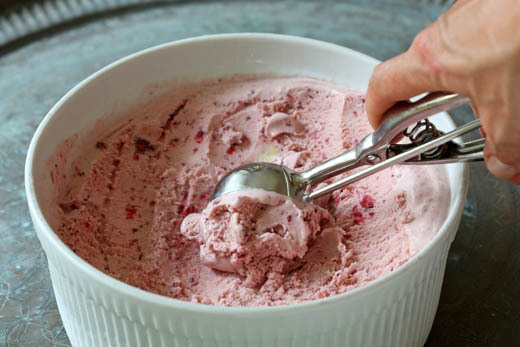 The strawberry recipe for this ice cream is incredibly good! About eight months after losing my job of 15 years (that I loved), I started creative cooking, making everything from scratch, and found we can never eat any other way again, ever! I acquired an ice cream maker when purchasing some kitchen gizmo (I don’t even remember what it was now) over a year ago and was given the choice of a free ice cream maker or a juicer with the purchase. The ice cream maker sat, unopened, in my pantry since it arrived. Last summer I came across a fabulous recipe for a cantaloupe and honey dew sorbet that looked too good to be true so, I dragged out the machine to make it and haven’t put it away since! I’ve made at least seven different strawberry ice cream recipes since I’ve been using this lovely machine but never have they had the flavor this strawberry recipe does. I personally would have never thought to use balsamic vinegar or corn syrup with strawberries (or in ice cream, for that matter), but what a difference it made to use these two ingredients. Not to impugn your vanilla ice cream base recipe but I prefer not to use eggs in my ice cream if I can get away with not using them. I found two recipes for vanilla ice cream that use no eggs and combined them, making some adjustments and adding one ingredient to make my version of the best vanilla, egg free ice cream and base. I used my vanilla base recipe with your strawberry recipe and cannot keep enough of this confection in my house! It’s too fabulous not to make it at least two times a week (more during strawberry season!) to always have plenty on hand for family, friends and company! Thanks so much for sharing this recipe! I adore your blog. I’ve made many of your bread recipes from loaves to pizzas and muffins and loved them all! Thanks! I ended up with about 1-1.5 cups of roasted strawberry puree. This seems like a large volume to add to the ice cream base. Should I cook it down to a smaller volume before adding to the ice cream base? Thank you.